TAG Heuer Men’s WAV5112.BA0901 Grand Carrera Grand Date GMT Watch: The automatic movement of the soft-spoken silver dial passes hours, minutes and seconds away with a small rotating dial. The date sits at 12 o’clock and the discreet band snuggles the wrist in custom comfort. This watch has a subtlety to its impeccable style that is unmatched. 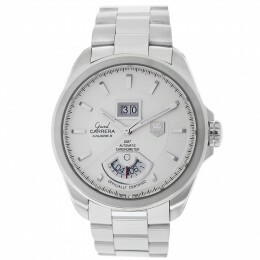 The TAG Heuer Men’s Grand Carrera Grand Date GMT Watch is a beauty that’s fully constructed of stainless steel. This watch offers guaranteed timekeeping precision and components of superior quality, backed up by the included chronometer certification. The steel link bracelet incorporates a secure buckle holding it confidently in place on your wrist. The sapphire window is scratch-resistant and shields the sleek design of fancy yet functional dash hour markers, minute indexes and date calendar. The Swiss Automatic watch movement is powered by the movement of your own arms, making this a unique and luxurious timepiece.